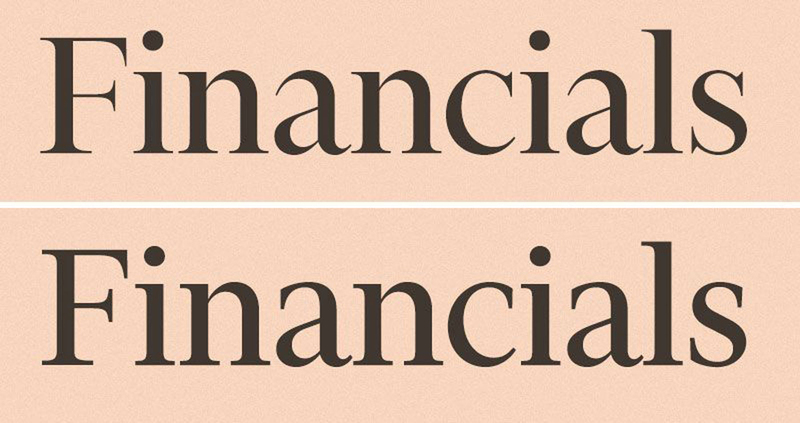 Financier is a new typeface family drawn for the redesign of the Financial Times (FT), which was launched in September 2014. It comprises two complementary sets of styles: Financier Display and Financier Text. Kevin Wilson and Mark Leeds provided design direction over the course of several months. The brief was to produce a sharper, more modern newspaper that shows off the FT’s strengths in reporting, analysis and visual journalism. The newspaper needed to be more than just a snapshot of the website at a particular point in the day, but an edited selection of the best the FT has to offer. It needed to complement FT.com and provide a competitive ‘finite’ read of ‘what you need to know’ each day. The previous eight-column grid (left) compared to the new six-column grid (right). 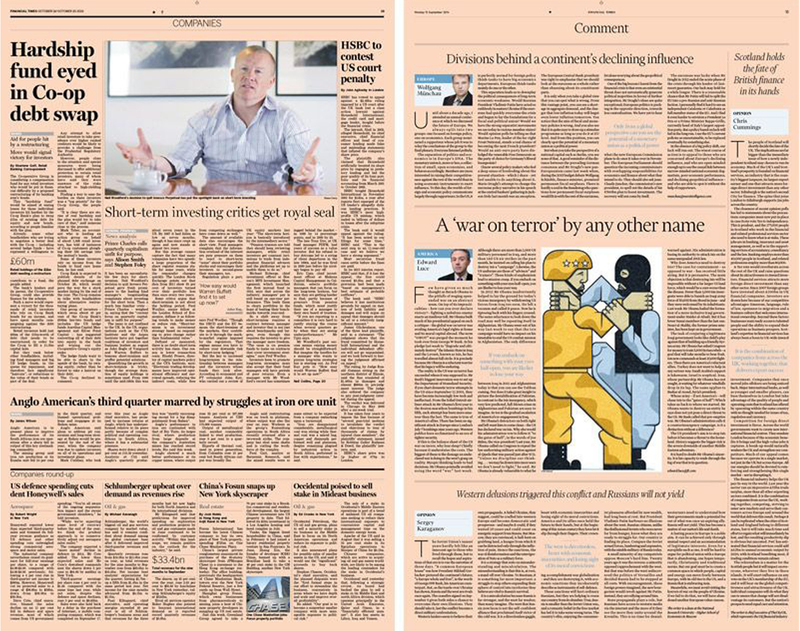 Previously the FT was a traditional eight-column broadsheet with the intense, crammed typography endemic to newspapers. Kevin wanted to explore a wider grid for a cleaner, more relaxed design — providing breathing room for articles and greater separation between news and analysis. The previous typographic palette consisted of the excellent Miller, Benton Sans and Clarion. The FT wanted an elegant, authoritative serif with the versatility to handle news and features in the arts, science and sport — as well as finance. Furthermore, the typeface had work across media, from wide-printed broadsheets to narrow mobile screens. This initial Old Style concept was rejected. Our initial discussions started with the relative merits and drawbacks of Tiempos Text and Tiempos Headline. My first concept was essentially a contemporary Old Style: a rationalised Caslon filtered through the plain pragmatism of Imprint. The press tests quickly nipped it in the bud: compared to Tiempos, it felt too bookish, too delicate, too ‘slow’. This false start helped hone the intent of the typeface. Mark noted that to signal the FT’s new direction, the typeface needed to move away from Miller towards something sharper at small sizes. He suggested exploring an option without ball terminals. This single comment from Mark was key. Samples from ‘Linotype Newspaper Body Faces’. 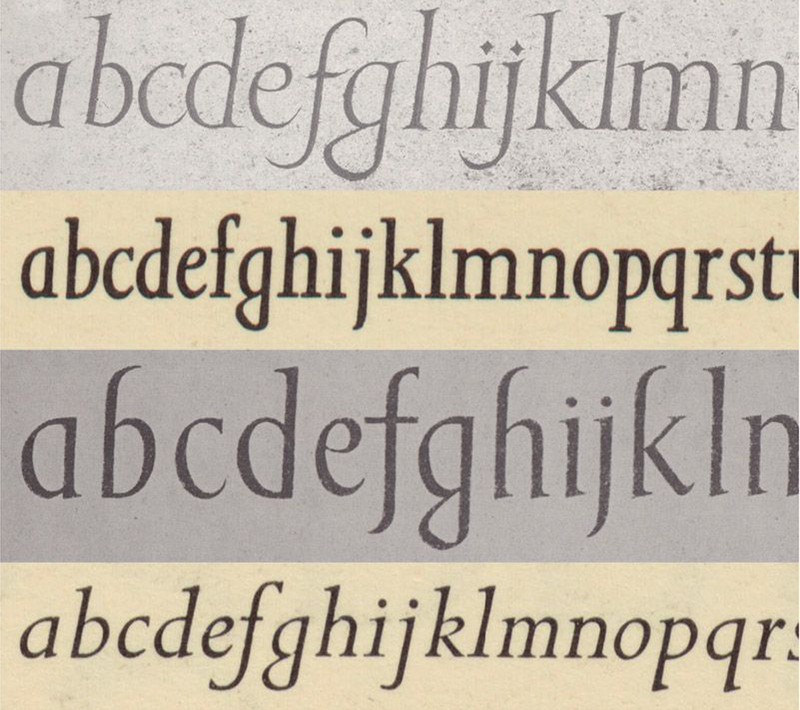 From the top: Textype (1929), Ionic Nº5 (1925), Paragon (1935), Opticon (1935). A festival of ball terminals. 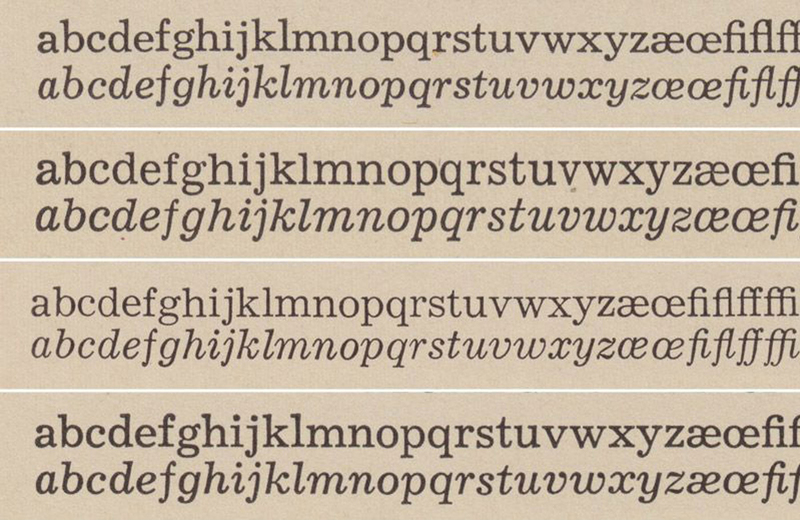 The majority of newspaper typefaces have ball terminals — it’s part of their heritage. I found it surprisingly difficult to move away from them; I really had to re-evaluate my assumptions on the genre. Gerard Unger has made several idiosyncratic newspaper typefaces (which are fantastic) without ball terminals, but he’s an exception. So I started scratching around for good models that fitted the bill: something with decent proportions for newspaper text and headlines, without ball terminals, that could support a range of weights and would work well on digital screens. As a bonus, something with British heritage would be ideal. Gill’s typefaces: Perpetua (top), Solus (middle) & Joanna (bottom). I settled upon Eric Gill’s work, particularly Solus, Joanna and Perpetua. I quickly roughed out a Text and Display cut over a couple of days. Broadly speaking, Financier Text follows aesthetic cues from Solus and Joanna, and Financier Display follows Perpetua. Perpetua specimen from ‘The Fleuron No. 7’, 1930. I’ve never really been a fan of Perpetua as a text typeface. It’s fussy, sharp and a bit awkward. But as a titling typeface, especially in all-caps, it’s utterly elegant. The awkwardness recedes into a stately charm; it’s taut, warm and undeniably British. It’s got Gill’s fingerprints all over it and that’s totally fine. You can sense the innate inscriptional quality, informed by Gill’s years of masterful stone carving. It was an excellent starting point for Financier Display. The first drawing of Financier Display Regular (top) compared to the final (bottom). My first drawing for the Display was very sharp. Too sharp. The Display styles had to work at 18pt at the smallest size, and this simply fell apart. We wanted to keep the letterforms keen but needed to reduce the contrast. This was a slight contradiction, leaving me in a bit of a quandary. After several attempts to find the correct contrast, I struck upon the idea of keeping only the joins sharp. This worked a treat: the serifs and hairlines could be beefed up, whilst the joins imparted the necessary sharpness. Top: Gill’s sketch for Solus. 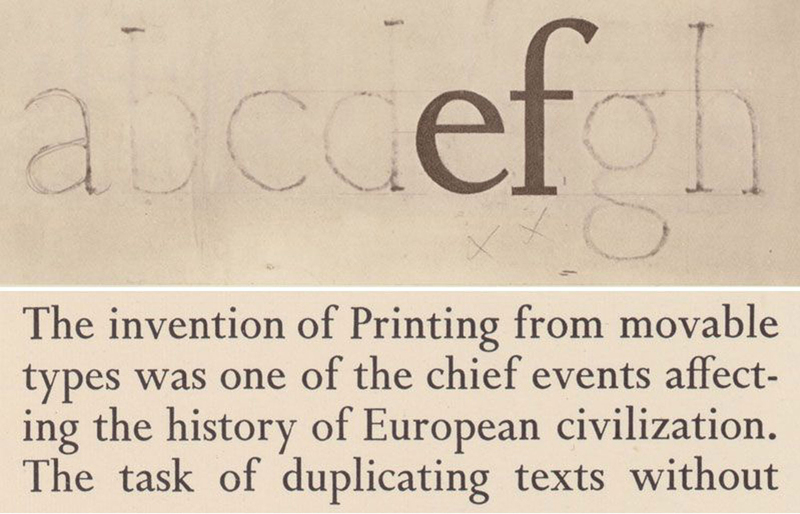 Bottom: Monotype Series Nº 276, Solus, from ‘The Specimen Book of Monotype Printing Type’, Vol. 2. Solus is a wonderful typeface. It has all the distinct Gill traits. It’s spare, elegant and robust. It’s aged very well and its bones are still sound. What struck me about Solus was its aesthetic efficiency. It’s very basic, as if Gill has taken the concept of a classic serif text typeface, blown the dust off, and reduced it to its bare minimum. 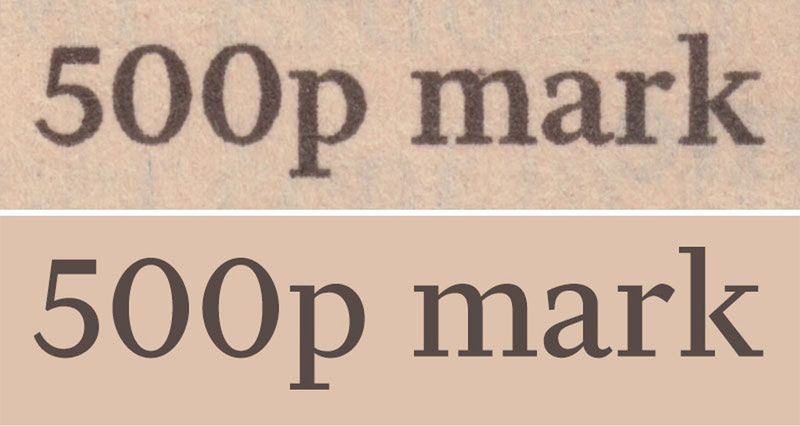 A comparison of proportions between Financier Text Regular (left) & Tiempos Text Regular (right). I decided that the Financier Text styles didn’t need to be typically ‘newspaper’. Tiempos Text, for example, is a newspaper typeface with all the classic traits: narrow width, large x-height, small cap-height, open counters and robust serifs. It’s almost a cliché — any half-decent newspaper text typeface can be described as such. I had to keep in mind that the FT grid was opening up, and that articles were moving towards a longer form. Mobile screens were also an important consideration — in portrait they have a narrow horizontal width, but (theoretically) infinite vertical space due to scrolling. This informed the expected horizontal efficiency of the letterforms, but allowed the x-height to be lowered and the ascenders to be a touch taller. This effectively took the typeface away from typical newspaper proportions towards something more elegant. A comparison between the printed type and the digital outlines. Newsprint is a brutish environment for typefaces. Outlines get distorted; small gaps get filled in; and black ink turns grey and bleeds all over the shop. Despite this, none of the Financier Text letterforms have so-called ink traps. Their joins are deep and sharp, like Financier Display, but in this case they’re designed to anticipate the ink. They’re complemented by flat, unbracketed serifs and beaked terminals that also serve as robust countermeasures. This is where the plain pragmatism of Solus really shines through. 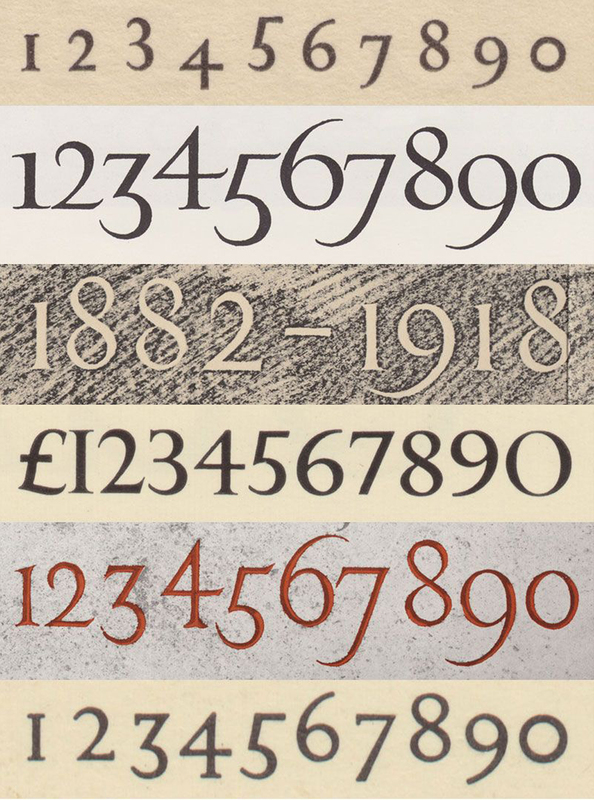 An array of Gill’s numerals. Numbers are very important to the FT. Prices, dates, percentages, stock listings — most articles have a healthy fistful of figures. I love drawing numbers. They’re a special part of a typeface family. Thankfully Gill drew some pretty wild numbers during his career, providing fertile raw material for inspiration. Lining and old-style numerals from Financier Display Medium (above) & Text Regular (below). 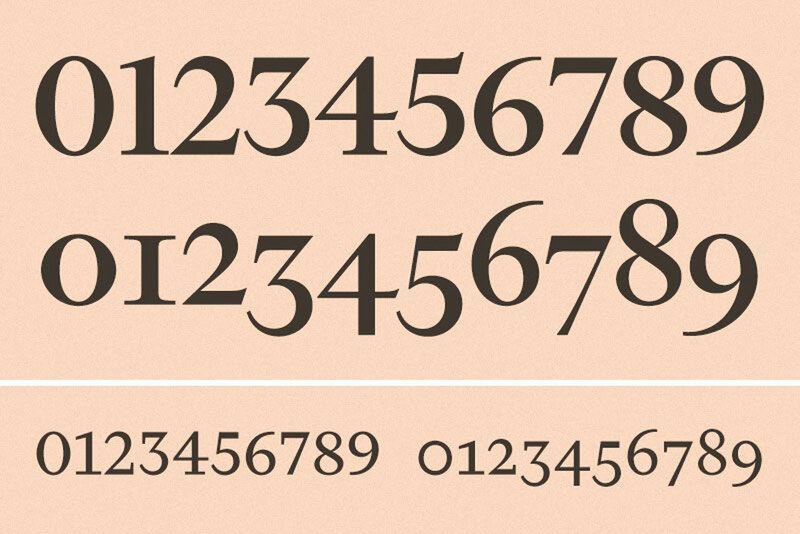 Gill’s numerals are distinctive: the flat-top 3, dynamic 5, three-quarter-height old-style 2, and the graceful sweep of the 6 and 9. These characteristics all help to differentiate one from the other, which is especially important for numerical data — numbers are ‘read’ differently to words. Because the ascenders are taller than the cap-height in Financier Text, default lining numerals (and, incidentally, things like acronyms) harmonise rather nicely in running text. A selection of Gill’s Italics across various styles. I’m not sure why Gill’s idiosyncratic Italics tend toward ‘sloped Romans’. Perhaps they’re influenced by his inscriptional work and aesthetic pragmatism. They’re typically narrow with a slight incline. They have a frugal, staccato grace, creating a formal typographic atmosphere that never feels dry. They’re definitely on the right side of boring — so plain they’re interesting. It took me a while to get my head around them. 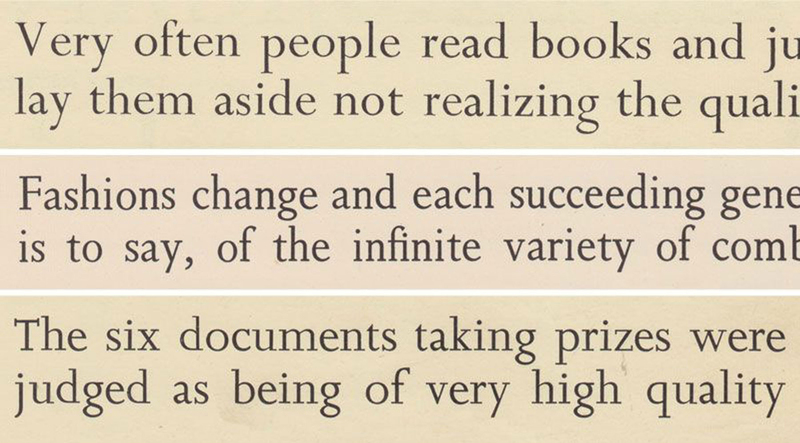 A comparison of italics in Financier Display Regular (top) & Text Regular (below). In both Financier Text and Display I’ve tried to reconcile the aesthetic of mechanically sloped Romans and ‘proper’ italics. They have the occasional flourish; the f, g and k are a nod to Gill’s work — necessary counterpoints to the neatness of the remaining letterforms. The Text Italic styles take the sloped Roman concept as a starting point and remove just enough extraneous detail to make them convincing. Happily, they have no trouble coping with harsh printing. The Display Italics are more fluid and detailed. The residual Roman baseline serifs on the h, k, m and n are a sly wink to Gill. And that g… I’ve never drawn one quite like it. It’s a beautiful shape — strange and classy all at once. I still can’t believe it was approved! 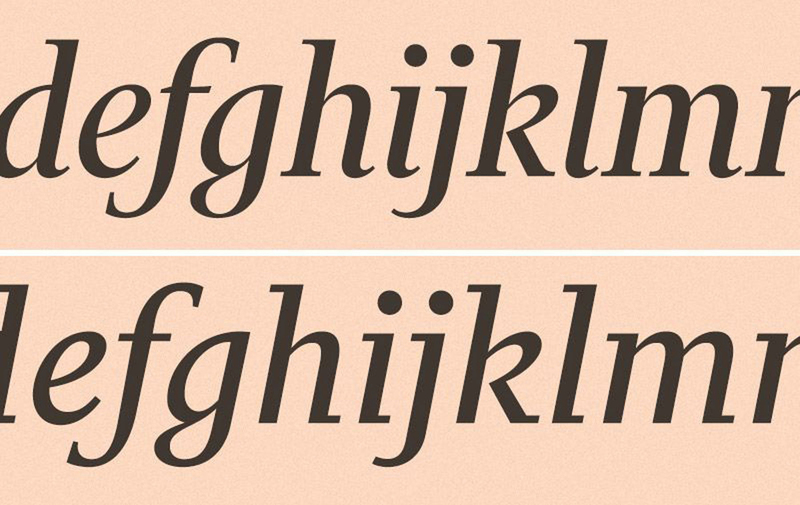 A comparison of proportions and details between Financier Text Regular (left) & Financier Display Regular (right). This is the first time I’ve made a typeface family with ‘visually compatible rather than consistent’¹ text and display styles. They feel like they belong together, rather than merely looking similar. A ‘consistent’ family, for example, would be Tiempos Text and Headline — the Headline styles are derived specifically from the Text styles. It’s been an interesting and rather liberating approach. To finish, I must extend my sincere compliments to Kevin and Mark. They are simply wonderful clients, which has been clear in our discussions and design process: considered, thoughtful, and productive, despite the antisocial time differences. I appreciate their trust, and hope that I have responded with appropriate typefaces. ¹For a deeper understanding of the intricacies of ‘Text’ and ‘Display’ typeface design, please refer to the excellent ‘Size-Specific adjustments to type designs’ by Tim Ahrens & Shoko Mugikura. Perpetua®, Solus® and Joanna® are Trademarks of The Monotype Corporation. All other trademarks are the property of their respective owners.